Thank you for visiting our site, 247Driver.com. 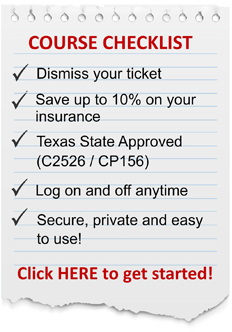 This site was created by 247TexasDriverSafety.com, a State approved Texas Driver Safety course provider (cp156). The program offered through this site and through 247 Texas Driver Safety.com covers a wide range of driver safety topics, from seat belt usage to road rage. You may be eligible to take a Driving Safety Course (Driver Safety Course) on any one of the moving violations shown on the ticket you were issued. If you were cited while operating a motorcycle, you may be eligible to take a Motorcycle Operators Training Course (MOTC) instead of the Driver Safety Course. You may not take more than one Driver Safety Course or MOTC per year anywhere in the State of Texas to get a ticket dismissed. However, if one of the violations for which you were cited is for not having a child safety seat or not having a child properly in the seat, you may be eligible to take a Child Seat Belt Safety Course in addition to the Driver Safety Course or MOTC. If you were cited for any of the following, you are not eligible to take a Texas Driver Safety Course for that violation. Note: If you had a commercial driver's license at the time of the violation, you are not eligible to take Driving Safety even if you were driving a non-commercial vehicle. Please note that you can only take Driving Safety for ticket dismissal once per year. Additionally you MUST request permission to take this course for purposes of ticket dismissal by the appearance date shown on your ticket. Your driving record must reflect that you have not completed a Driver Safety Course or Motorcycle Operator's Training Course, as applicable, within the last 12 months preceding the date of this offense. Get your certificate on time! We feel your Texas Driver Safety experience should always be a positive one. Our company will work with you at all times to help you get your ticket dismissal or insurance reduction.